We're excited to report that Bovada had an excellent Thanksgiving gift for New Yorkers. As of Thursday, Nov. 22, 2018, the renowned Bovada.lv website is open again for business in the State of New York. NY residents can now enjoy the sports betting, racebook, casino, and poker action that they had been excluded from for more than a year. The major category of New York residents who stand to benefit from this recent development are those who like to engage in sports betting and wagering on the ponies. You see, the state was already serviced by Bovada's partner site Ignition Casino, which has pretty much the same poker room and casino options as Bovada. However, Ignition lacks both a sportsbook and a racebook. Yet, even those who already play at Ignition and aren't interested in betting on the outcomes of athletic contests and horse races can still benefit from being able to now register a Bovada account. This is because Bovada offers a full complement of welcome bonuses to new customers. They are a 50% up to $250 sports deal (50% up to $500 if you deposit with Bitcoin), 100% up to $1,000 in the casino usable three times for $3,000 total (150% up to $1,500 also usable three times for BTC) and 100% up to $500 in the poker room. These offers can be claimed even if you are already a member of Ignition Casino. 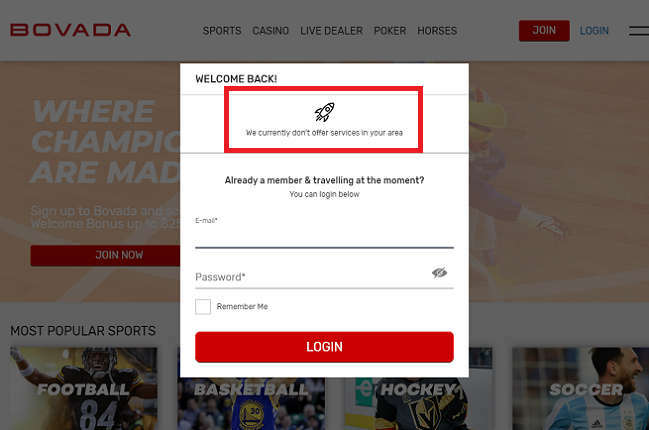 In fact, pre-existing Bovada users from a long time ago who have just had their accounts reactivated are also eligible to get a new set of welcome bonuses. Bovada has had a long and confusing record when it comes to dealing with players from New York. New Yorkers were welcome to play on the original Bodog site back in the day, but they were switched over to the new brand Bovada.lv along with all other American players in December 2011, perhaps as a consequence of Bodog wishing to limit its exposure to the United States in the wake of Black Friday. This wasn't enough, though, as Bovada in 2012 stopped accepting new NY customers while “grandfathering” in existing accounts from the state. The Black Friday indictments were filed in a NY court, which is most likely why New York was considered a “bad” state that warranted extra caution. For about two years, those who already had accounts in good standing before Bovada's closure to New York were able to keep playing, withdrawing, and depositing like normal. However, in June 2014, the site ended the ability for New Yorkers to make any deposits at all, so they were restricted to using the money they already had in their balances. Things appeared to have reached a new equilibrium at Bovada vis-à-vis New York, and the situation was unchanged for a couple of years. But then in August 2016, the company announced that it had sold its poker division to Ignition Casino and would cease offering poker at the end of September. Because Ignition prohibited New Yorkers from signing up, this left card lovers in the state without any poker room on the largest offshore poker network for Americans that they could access. At this point, they could still play in the casino and bet on sports at Bovada though. Bovada returned to the poker market in August 2017. Ignition didn't close its poker room at this time; rather both of these sites remained in operation simultaneously. 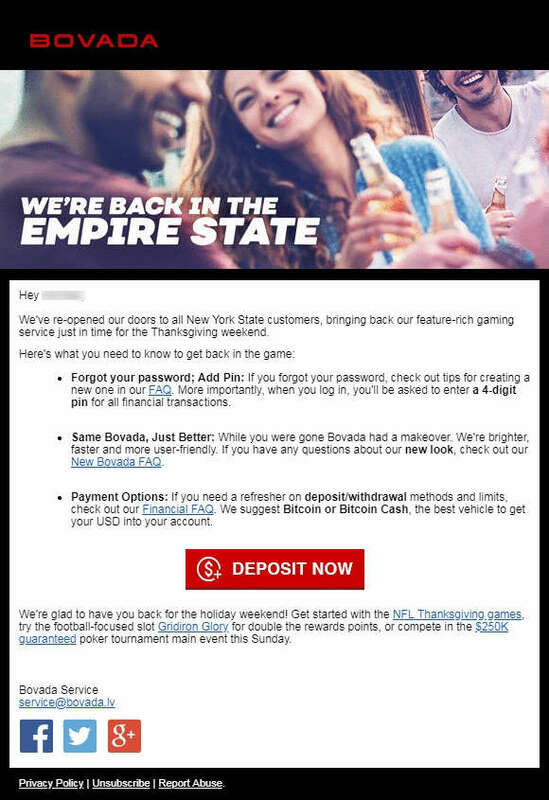 Any hopes that Bovada would become again a poker destination for New Yorkers, at least those with existing accounts, were to be shortly dashed though. You see, in September 2017, Bovada informed all its NY-dwelling sportsbook and casino customers that the firm was no longer transacting in the state at all effective Oct. 2, so they were booted off the site at that time. Fortunately, Ignition quietly reopened to New York at around the same time although the news wasn't publicly announced, and the only real way to find out about it was by reading Ignition's terms of service, which had been updated to remove NY as a prohibited state. Now, finally, Bovada is back for New York, giving residents of the Empire State a choice between two fine poker rooms on the PaiWangLuo Network. If you're a New Yorker who longs to play poker, bet on sports, and sample thrilling casino gameplay, then Bovada is now ready to accept your action. Read our comprehensive Bovada.lv review to learn all about the 100% up to $500 poker bonus, triple 100% up to $1,000 casino bonuses, and 50% up to $250 sports bonus. For another option on the PWL Network, and one that has double the poker bonus money available ($1,000), check out our review of Ignition Casino Poker. For other New York-related poker information, including laws, a history of the B&M poker scene, and the offshore poker rooms available, take a look at our guide to playing online poker in the State of New York. You can find out more general info pertaining to all 50 states as a whole in our USA online poker overview page. Note: We have received word that not only is Bovada.lv back in the game in New York, but also its casino-focused partner brands Slots.lv and CafeCasino.lv have opened up to the state as well. New Yorkers can now register for all three of these fine gaming operators.